Of Lee’s Chicken Is Owning A Piece. Want to see how good it is to be famous? For the first time, Lee's Famous Recipe® Chicken is offering select single and multi-unit restaurant operators the opportunity to become a part of one of the most historic chicken franchises in the nation. We're looking for financially qualified entrepreneurs who have a passion to open their own business – especially those who have experience in the QSR industry and are prepared to open single or multiple locations. Complete a Preliminary Application and submit it for review. Speak with our Director of Franchise Placement, and request a copy of the Lee’s FDD (Franchise Disclosure Document). Review Lee’s Famous Recipe® Chicken FDD and complete Lee’s Famous Recipe® Chicken’s Financial Application Form. Attend one of our Lee’s Famous Recipe® Chicken Discovery Days. Sign your Lee’s Famous Recipe® Chicken franchise documents and make your intiial franchise fee payment. Secure financing (if needed) and identify the equity requirements necessary and select your store site for approval. Finalize real estate and begin the store design selection, permitting and construction process. Complete the Lee’s Famous Recipe® Chicken training course at one of our Certified Training Centers. 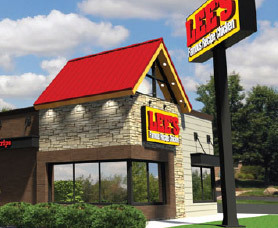 Begin the pre-opening process to celebrate the grand opening of your new Lee’s Famous Recipe® Chicken location. I’m ready for Step 1: Download the Brochure. Fill out the Preliminary Application. on becoming a Lee's franchisee, get in touch with us! I would like to receive information on current and future opportunities from Lee's Famous Recipe® Chicken. This advertising is not an offering. The offer of a Lee’s Famous Recipe® franchise may take place only through the delivery of a current Franchise Disclosure Document or prospectus. No franchises are sold until a prospectus has been registered and declared effective, and an offering document has been delivered to the purchaser prior to the sale in compliance with applicable laws.